A former coronary care nurse with a passion for ensuring business and industry is supplied with the best medical equipment has taken a top role with a Shropshire medical supplies distributor. Kate Slack has been appointed director of sales and marketing at SP Services (UK) to lead the team to promote further business growth for the company which this year celebrates 30 years in the healthcare industry. Kate (44), who qualified as a staff nurse after gaining a nursing degree, says: "SP Services is a progressive company with an excellent track record with three decades of experience and I am excited to play a part in their continued growth. "It is so important to have knowledge about the equipment we are distributing so we can ensure customers get the right medical and first aid equipment for their sector whether it is the NHS, emergency services, Government, military, sports clubs, the security sector and the world of business and industry." After caring for critically ill patients in a Yorkshire hospital cardiology ward and a coronary care unit in a West Midlands hospital, Kate made a career move selling medical equipment and supplies as a regional sales manager with pharmaceutical wholesale company Phoenix Healthcare Distribution. Kate has a 20 year career in the healthcare sector winning awards on the way, leading a medical supplies company to its best ever profits and building successful teams. SP Services MD Simon Leggett said: "Kate has a passion for healthcare, a great knowledge of medical equipment and a desire to help professionals in all the sectors that we distribute to. Her experience working in the health service mixed with her sales and marketing acumen will direct us on our next phase of strategic business growth." SP Services operate from the head office in Telford, centrally located for national and international distribution of emergency medical supplies. Leading product innovation, they collaborated with police to develop decontamination equipment to treat acid attack victims nationwide and supplied defibrillators for Border Force ports across the UK and were also called in by the Salisbury Russian spy poisoning case to deliver urgent supplies to the investigating team. 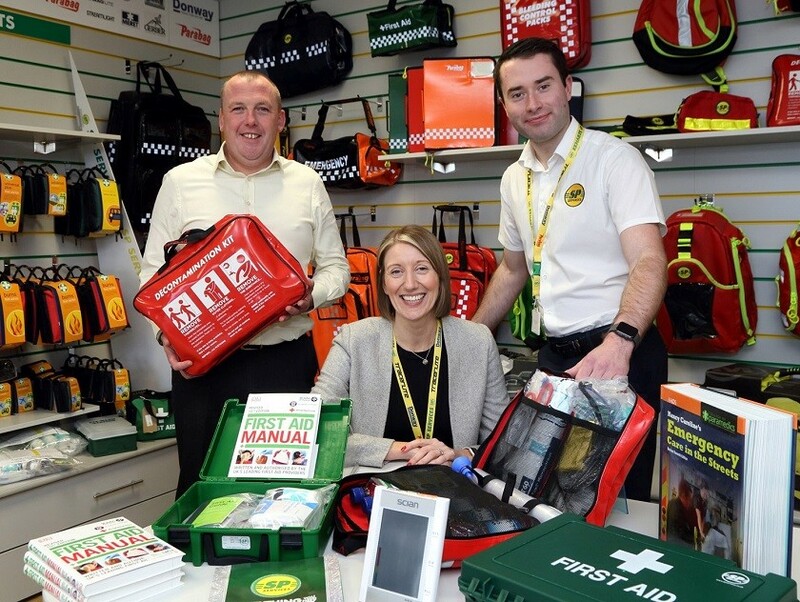 They supply everything you need in an emergency from plasters to personal protective equipment, bandages to blood pressure monitors, equipment bags to eyewash and first aid kits to furniture.